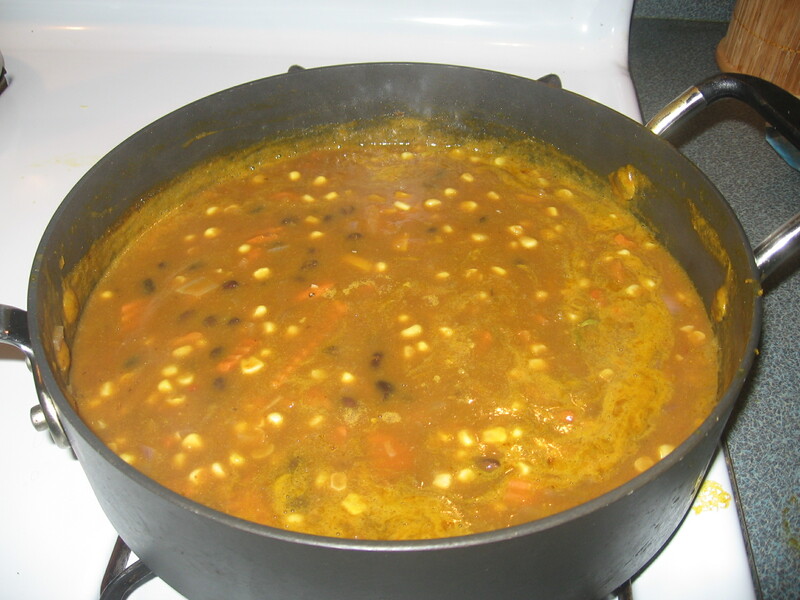 Pumpkin Black bean soup is one of my favorite comfort foods. I go this recipe out of a 15 minute meal cookbook. After making a few changes to the recipe it can still be put together and served within 30 minutes. The extra 15 minutes means more chopped and saute’d veggies which equals more flavor. I realize it’s not quite the season for canned pumpkin but I’m hoping people are as crazy as me and stock up on it during the fall for the rest of the year. My daughter made this using fresh pureed butternut squash in place of the canned pumpkin and had very good results. Saute onion, pepper, and celery in olive oil until translucent. Add garlic and seasoning and sauté for another minute. Add broth and black beans and bring to a boil over medium high heat. Lower heat to medium and add in pumpkin puree. Stir until well blended and simmer a few minutes. Stir in lime juice. When serving sprinkle fresh cilantro on top of the bowl.